I’m very excited to see a new speculative fiction magazine launch in Australia. It’s Dimension6, Keith Stevenson’s latest venture through his publishing house Coeur de Lion. Long time readers might recall that I interviewed Keith for GalacticChat a few months back. Keith is a mainstay of the Australian speculative fiction scene and one of its true innovators. I’m excited to see what he’ll do with Dimension6. Go and check it out – can’t argue with the price (free!). 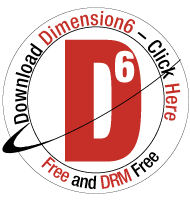 This website is also an affiliate for Dimension6 – you can download each issue’s copy from this page.